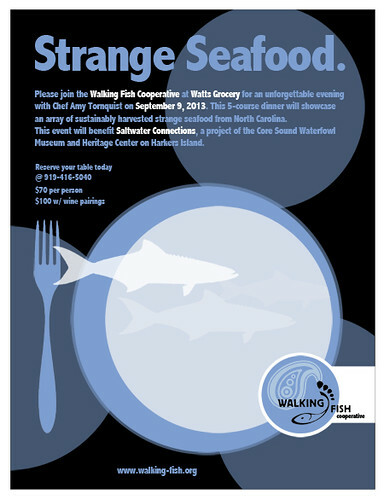 Watts Grocery joins forces with Walking Fish Cooperative for the 1st annual Strange Seafood gourmet dinner on Monday, September 9, 2013, at 7 p.m. Attendees will enjoy a 5-course decadent dinner that showcases an array of sustainably harvested strange seafood from North Carolina. Chef Amy Tornquist will prepare an unforgettable meal featuring a variety of “strange” seafood. Proceeds from the event will benefit Saltwater Connections, a project of the Core Sound Waterfowl Museum and Heritage Center on Harkers Island. Saltwater Connections is a regional initiative aimed at sustaining livelihoods, cultural heritage, and natural resources along North Carolina’s central coast, from Hatteras Island to Ocracoke and Down East Carteret County. “Like our cooperative, the Strange Seafood event is about celebrating the diversity and flavors of North Carolina’s seafood and the unique coastal communities that depend on commercial fishing,” notes Lin Chestnut, a founding member of the Walking Fish Cooperative. The dinner will be $70 per person or $100 w/ wine pairings by the Hope Valley Bottle Shop. To reserve your table and support the region’s unique coastal heritage, contact Watts Grocery at 919-416-5040. With roots firmly planted in North Carolina, Watts Grocery takes its name from the Watts-Hillandale neighborhood where chef Amy Tornquist has fond childhood memories of the Watts St. Grocery candy and snack stop in Trinity Park. Featuring local foods by the forkful, Amy weaves them into her cooking to create a distinctive take on North Carolina cuisine. Watts Grocery combines easygoing Southern hospitality with dishes such as fried oysters with remoulade, chicken and dumplings topped with cheese biscuits, and Meyer lemon mousse. Durham’s night owls feast on the unconventional bar menu featuring fried chicken gizzards with garlic aioli, hush puppies with basil mayo and red velvet cupcakes. For more information visit, http://www.wattsgrocery.com or call 919-416-5040. Watts Grocery is located at 1116 Broad Street, Durham, NC, 27705. Connect with us on Facebook at Facebook.com/WattsGrocery or on Twitter @WattsGrocery. Founded in 2009, the Walking Fish Cooperative operates an award winning community supported fishery (CSF) that links fishermen on the coast of North Carolina to seafood-loving consumers in the Triangle. The goals of this community-owned and operated venture are simple: to foster economic opportunities, to cultivate healthy communities, and to encourage environmental stewardship. What better way to invest in a sustainable future and get fresh, local seafood? 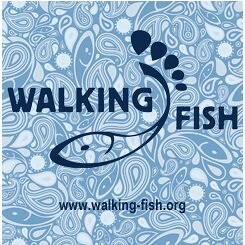 For more information or to sign-up for the upcoming CSF, visit http://www.info@walking-fish.org. Support us on Facebook at http://www.facebook.com/WalkingFishCSF. Photos from the event are available @ https://www.facebook.com/WalkingFishCSF. Thanks for your support!